StarFox Command is the first (and latest as of this writing) entry on the Nintendo DS of their famed space combat franchise. It is also the first StarFox to make an appearance on a portable platform, in addition to being the Fox\'s debut online. This is the fifth StarFox game. The last two games on the GameCube, according to some, strayed significantly from the original formula that many expected from them. StarFox Command returns to the primarily space combat game play style, along with some strategy elements to boot. In this game, not only do you try to save the Lylat system, but you command the destinies of Fox McCloud and his friends as well. What is the core game play like? StarFox Command is a hybrid strategy and space combat game where you fly your Arwing (or equivalent for characters other than Fox) and blast your opponents out of the sky. In the story/dialog part of the scenario, the story is progressed, and you also make certain decisions that effect not only which missions you play, but also who you play as, and what the ultimate outcome or ending is. You cannot choose your path the first time through the game, but everytime thereafter you can. It\'s pretty neat, as you can mix it up each time and there are nine different endings to experience. Each mission is not simply a single level that you fly through like in many past StarFox games. In this game, you command each member of your squadron around a simple, 2D map that has icons on it which represent your ships, various item pickups throughout the map, as well as enemies, bases, and other hazards. Each command takes place on the touch screen where you manually perform each action with the stylus. You have a limited number of turns to complete each mission in, though when you capture a base you get two more turns to extend the number of rounds deployed. Strategy is fairly important, as doing things the wrong way or too slowly will almost certainly lead you to a \'mission failed\' screen. Another aspect is that you have a limited time before your fuel runs out. You can get more fuel by finding fuel pickups throughout a mission map, or in a combat zone. You can also destroy certain enemies who sometimes leave fuel behind, or do a barrel roll and dodge laser fire, which also adds usually two to three seconds to the clock. It can get hairy sometimes, but if you get ahead of the clock curve, you can carry that time over into the next encounter. Conversely, if you are behind, that carries over, too. There\'s nothing worse than going into a mission with five seconds remaining.. you are certainly doomed to death at that point. Since you command each member of the squadron individually, you will often find yourself piloting a ship other than the Arwing and with a different pilot inside. As you engage enemies on the battlefield, you enter ship combat sequences. In these, you see behind your ship as you fire away. You fire by pressing any button on the Nintendo DS, including the D-pad. All other control, including aiming your ship, is done via the touch screen. Though it certainly takes some getting used to, I have come to enjoy the controls a lot. Dragging the stylus around the touch screen aims your fighter. Double-tapping the top half of the screen will make you boost, while double-tapping the bottom half will cause you to slow down. \'Scratching\' the screen left and right quickly will cause you to barrel roll, which is extremely important in this game and used a lot. You can also hold down a fire button for a charge shot, and by dragging a bomb onto the appropriate part of the map screen you can do significant damage to all enemies in an area. There are also touch screen buttons for performing a loop-de-loop or doing an instant turn around. I really enjoyed the space combat scenes, even if they are different than the typical classic StarFox levels which were \'on rails\'. An \'on rails\' level is one in which the player is forced down a path that they do not have a choice but to follow. I also really enjoy playing as many of the different characters. Fox, Slippy, Falco, Krystal, and many others each have a unique feel to their fighting style. Fox is well balanced, Krystal is fast but does not have as powerful of armor, Falco has an incredible multi-lock capability with good firepower but low armor, and Slippy is incredibly slow with a lot of power and armor. I found him almost useless until I was in a one-on-one fight with plenty of time.. and I found even Slippy can be powerful. It\'s really fun when you find it difficult to defeat a particular enemy to mix it up with someone else who may have an edge against it. In StarFox Command, they try with fairly good success to model the space combat graphics style after the first two games, StarFox and StarFox 64. I think they succeed. For those who have played the classics, the graphical similarities are undeniable. They are not of the best of quality at times, but certainly sufficient and stylized as you might expect from a classic StarFox. The character story sequences look nice, though not outstanding. The strategic map scenes perform their tasks, but are very basic graphically. Everything is represented with a 2D symbol there, including members of your team. I have never had any problems with the frame rate dipping unacceptably. Each character\'s voice is a gibberish that is \'spoken\' in different pitches to distinguish each character. It was kind of surprising to me at first, but it isn\'t annoying or anything. You can also program the game to use a voice sample from you to base the gibberish off of. Sound effects are as you might expect them to be. Combat firing and explosions are satisfying, and map/strategy view has simpler sound effects. I can\'t really complain about the sound effects. The music is decent. Nothing that I would really want to hear outside of the game so much, but decent. Each character has a different theme when in a battle, which further helps differentiate them, if a different looking ship and weapons, armor, and maneuverability are not enough. Not too many amazing pieces of orchestration, but no reasons to turn down the volume, either. This game features up to six players in single-card multiplayer, as well as up to four people at a time who can duke it out online. 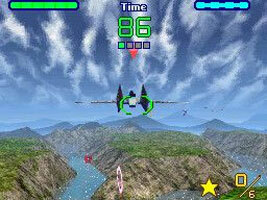 There is only one basic mode, which is dogfighting with up to four players online, or six players wirelessly. Internet play consists of two modes: Battle Royale and Free Play. On Free Play, no statistics are tracked at all on each match. This is a good way to practice or enjoy a one-off battle. In Battle Royale, everything you do effects your rank. This is what you join for more \'serious\' play. At the time I was trying to play online, I found it easy to join a Free Play match, but more difficult to find a Battle Royale match. I do not know if it is always like this. Multiplayer is smooth and definitely fun for what it is. Honestly I was a bit disappointed that it was so simple though. Having more variety in flyable characters and game modes would have been great. Though it seems to me a bit of a missed opportunity, for what it is it\'s very well done. In StarFox, there is a lot of flying, shooting, and blowing up of robotic ships and creatures. There is some shooting down of pilots, which do not always die, but sometimes do. There are also some plot twists in which you can choose to have characters go with your friends, strike out on your own, or join other factions. Also several of the female characters are depicted as having rather \'obvious\' breasts, though mostly through tight clothing. Of course all characters are anthropomorphic animals, and not people per se. The ESRB gives this game an E10+ for the rating, and I tend to agree with their assessment. StarFox Command is a very fun game with controls that work very well once you get used to them. I played this game with the thumbstrap which I greatly prefer to the stylus for games with similar controls, but even with the stylus it works very well. Single player mode is a lot of fun and has a lot of twists and turns if you are willing to replay it a few times to see multiple endings. Without taking advantage of multiple endings, it is fairly short. Also the main game is fairly easy to complete, but some of the scenarios of the other endings are definitely challenging. Multiplayer is somewhat simple, but very fun for what it is. I would say this game is very good overall. I wish it was more in a few ways, but I do like it a lot. Not great, but very good. I recommend it to anyone who enjoys the StarFox series or other similar third-person space combat games, assuming the relatively minor appropriateness issues are considered first.